Born in Nanchang, China, Cheng Shu Ren (Arthur) established his reputation as an outstanding artist in Beijing. He has won many awards with distinction and in 1985 he was named in The British Who’s Who. His versatile works include extensive garden and park designs in Shanghai. His bronze and marble sculptures and monuments have won him many prestigious awards from the Shanghai Arts Festival. 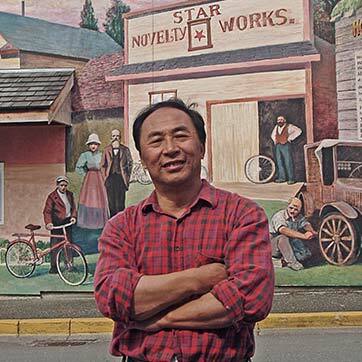 His submission for this mural was chosen from among 14 in a competition sponsored by the Canadian Chinese Artists Federation, and he became the first Chinese artist to enhance the walls of Chemainus. Cheng came to Canada in 1990 and now enjoys the freedom of artistic experiences and the new challenges this country offers. His daughter, Chen Ying, assisted him in painting Memories Of A Chinese Boy, which they completed in just 14 days. He also created the statue of H.R. MacMillan in Waterwheel Park, and returned in 2005 to paint Star Novelty Works.